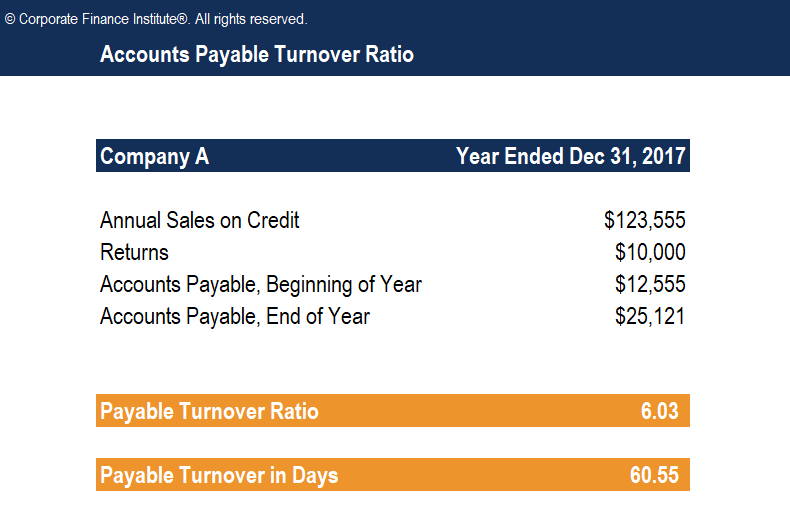 This Accounts Payable Turnover Ratio Template will show you how to calculate payable turnover ratio and payable turnover in days. The accounts payable turnover ratio, also known as the payables turnover or the creditor’s turnover ratio, is a liquidity ratioFinancial RatiosFinancial ratios are created with the use of numerical values taken from financial statements to gain meaningful information about a company. The numbers found on a company’s financial statements – balance sheet, income statement, and cash flow statement are used to perform quantitative analysis and assess a company's liquidity, leverage, growth that measures how many times a company pays its creditors over an accounting period. The accounts payable turnover ratio is a measure of short-term liquidity, with a higher payable turnover ratio being more favorable. The accounts payable turnover ratio indicates to creditors the short-term liquidity, and to that extent the creditworthiness of the company. A high ratio indicates prompt payment being made to suppliers for purchases on credit. A high number may be due to suppliers demanding quick payments, or it may indicate that the company is seeking to take advantage of early payment discounts or actively working to improve its credit rating. A low ratio indicates slow payment to suppliers for purchases on credit. This may be due to favorable credit terms, or it may signal cash flow problems and hence a worsening financial condition. While a decreasing ratio could indicate a company in financial distress, that may not necessarily be the case. It might be that the company has successfully managed to negotiate better payment terms which allow it to make payments less frequently, without any penalty.